On March 6, 2004, Sharon Herzog peacefully passed away at her home in Port Moody, Canada with her husband and daughter at her side. José Carreras International Leukemia Foundation in Germany, Spain or the USA, the Canadian Cancer Society, or the Heart and Stroke Foundation of British Columbia. 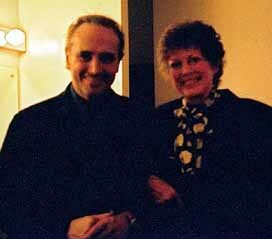 Sharon was not only my dearest friend and colleague, but also a dear friend to those hundreds of admirers of José Carreras around the world who came to know and love her through her mailing list. None of us will ever forget Sharon's wonderful sense of humour, her boundless energy, and above all, her great kindness and generosity of spirit. Our lives are immeasurably richer for having known her. Sharon's husband, her daughter and Sharon's many friends worldwide. When Sharon passed away so suddenly, our first thoughts were to somehow let those of you who loved her so dearly know. Unfortunately, neither Lisa nor I knew to find our way through Sharon's voluminous lists - or even how to put the computer connections back together after the EMT had done its work. You have our apologies, but we did sincerely try. Today things, communcation-wise, began to fall into place - mainly through the yeoman efforts of Mary Victor, with whom we finally established contact. We owe her a great debt in these very trying times - for her as well as for us. HERZOG Sharon, age 60, passed away unexpectedly, but peacefully at home, on March 6, with her husband, John, and her daughter, Lisa at her side. All who knew Sharon loved her warmth, her wit, and her charm. But it is her courage that was her most remarkable attribute. She had fought off numerous maladies in her short life, but this one last battle she did not win. Still, she fought it to the end and fought it her way. Besides her husband John and daughter Lisa, Sharon is survived by her parents, S. Ernestine and Phil Larson, brothers Steven and Douglas, and nephews Jordan and Mykel. A memorial service is scheduled for Saturday, March 13, at 4:30 PM at the Burquitlam Funeral Home, 625 North Road, Coquitlam. In lieu of flowers, please make a donation in Sharons memory to either the Canadian Cancer Society or the Heart and Stroke Foundation of B.C. Of course, donations to other charities are welcome too - especially Jose Carreras's beloved Leukemia Foundation. We take great comfort in knowing how many people dearly loved Sharon, and we trust that your love will live on through the gifts you make to life-saving causes. Sharon would have liked that. Thank you all for your concerns and for your expressions of sympathy.